I almost fell off my chair when I was scrolling through my Instagram feed this morning and saw all the first day of school pictures. Whoa! I thought it was still summer. Is it just me, or did your schools start the day after Labor Day when you were a kid? My girls go back to college this weekend, which is normal for college, but my son’s school is quite traditional (thankfully) and begins September 5th. But since I know many of you are back to a routine and schedule, I thought it would be wise to share a recipe for a real meal that you can make to get the troops back to normal. No more eating whenever it suits you. No more cheese and olives for dinner. Back to real food with real nourishment! 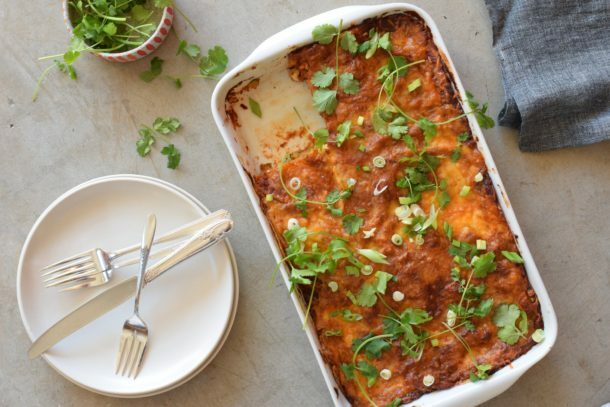 I know you are going to love this Mexican Lasagne, aka “Enchilasagne.” Mexican Lasagne is easier to say, so we’re going with that. Basically, replace the pasta with corn tortillas and the tomato sauce with a red enchilada sauce and you’ve got a delicious twist on lasagne. You can add meat to this or make this vegan. You might even be able to make this paleo with grain-free tortillas. It’s definitely worth a try! 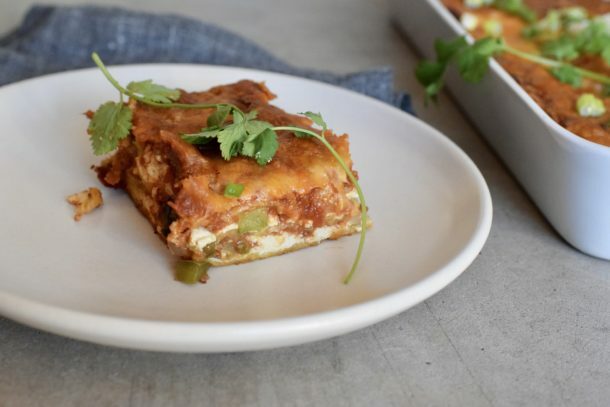 This is a hearty, easy and flavorful meal that my entire family loves and my students reported back with rave reviews from their families, too! My daughter has to limit her dairy and I have made this many times with Kite Hill almond milk ricotta and omitted the shredded cheese on top. Sometimes I’ll buy extra Kite Hill and dollop the top with it or just bake it with sauce on top and that’s that. I love adding veggies to the dish because I try to add veggies wherever it feels natural, and the addition of vegetables makes this a complete meal. I suggested onion, bell pepper and zucchini, because they’re all in season, but mushrooms, Swiss chard and eggplant would be great, too. Whatever you incorporate into the lasagne though, whether it’s meat or vegetables, must be cooked prior to adding. Otherwise, the flavor will be too bland and the vegetables/meat will release too much water. If you are still on summer break, enjoy it while it lasts! If your kiddos have started school this week, may the force be with you! To remind, I’ll be on The Today Show on Friday morning, most likely between 8:30 am and 9:00 am. I will be at The Gem in Dallas on Monday, August 21st from 10:00 am to 12:00 pm. And I’ll be on KHOU Channel 11 “Great Day Houston” on Wednesday, August 23rd around 9:45 am. Looking forward to it all! To make the enchilada sauce, warm 2 Tablespoons oil over medium-low heat in a small saucepan. Add the garlic and spices and sauté until fragrant, about 1 minute. Add the tomato puree, stock, salt, and pepper to taste. Simmer 3-4 minutes and taste for seasoning. Set aside. In a large skillet, warm 2 Tablespoons of olive oil and add the onion, zucchini, and bell pepper. Sprinkle with an ⅛ teaspoon each of salt and pepper and saute until tender, about 6-8 minutes. Set aside. Meanwhile, in a medium bowl, combine the ricotta and egg and set aside. 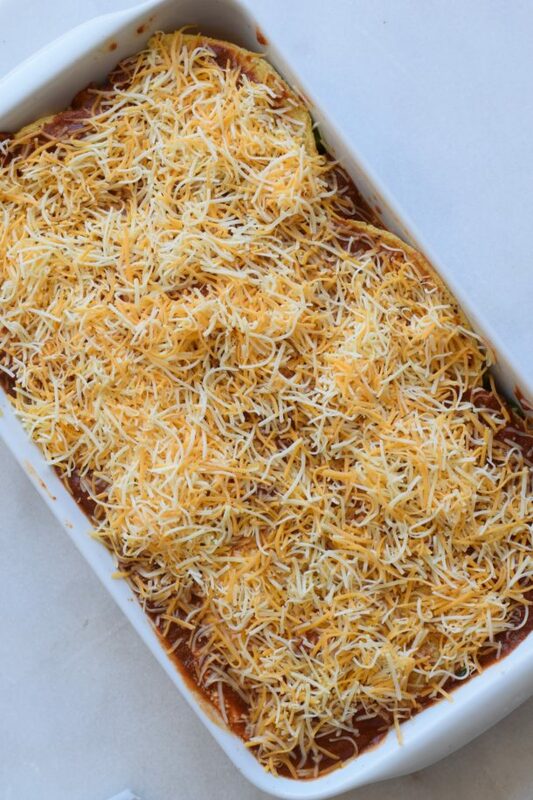 To assemble the lasagne, pour ½ cup of the enchilada sauce on the bottom of a 13x9-inch baking dish. Place 5 corn tortillas on top of the sauce. They can overlap since you want to cover the bottom of the baking dish. Take ½ of the ricotta mixture (about 1 cup), and with a spoon gently spread it over the tortillas. Top the ricotta with ½ of the sautéed vegetable mixture. Spread ⅔ - ¾ cup of enchilada sauce over the veggies. Top with 5 corn tortillas, and repeat this with the same ingredients (ricotta, veggies, sauce). For the last layer, top with 5 corn tortillas, the remaining sauce and 1 cup shredded cheese. Bake lasagne until heated through and cheese is melted and bubbly, about 25-30 minutes. 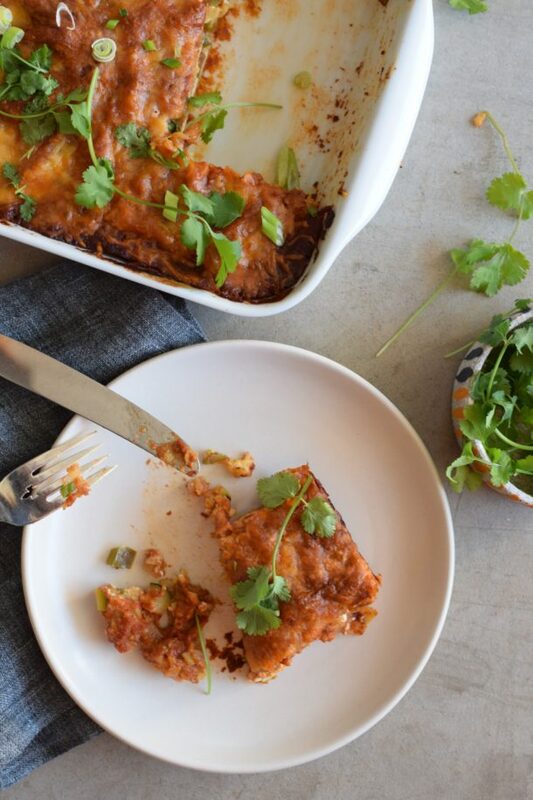 Loved this and added some left over chicken from your SLOW COOKER CHICKEN TACO recipe. Flavors were spicy just the way my guys like it! Perfect place to use that slow cooker chicken! I made this tonight and we all loved it! My husband said it was pretty good even though it didn’t have any meat in it. 🙂 I loved the sauce!! It tasted like the real deal. I usually make green enchiladas ( your casserole one) but I think I may make some red ones with this sauce. My kids didn’t think it was too spicy either. It had a little kick but was super flavorful. It was very easy to put together too. A nice salad and we had a yummy dinner. Thank you as always!